The hip new Lazy Hog makes its debut on Bridges Street, a charming enclave that lies between Sheung Wan, Mid-Levels and Soho. With a name that conjures a lazy animal, cooling down in mud, munching away at the feeding trough, the chefs say that it’s exactly what they want their customers to do. Well – maybe not the mud and trough part – but definitely resting their heels and eating. Serving American fare-inspired small plates, the passion project by previous chefs of Catalunya definitely wants to join the ranks of its famous neighbours in the area – like Yardbird and Little Bao – and serve tapas-style dishes to peckish diners who want quality food. 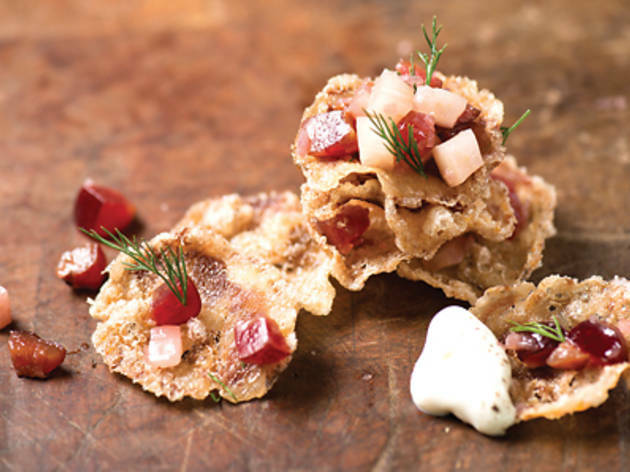 The simple menu offers items such as pig’s ear nachos (pictured above, $165) – thin slices of fried compressed pig’s ears served with pickled cherries and fennel – which are surprisingly moreish. 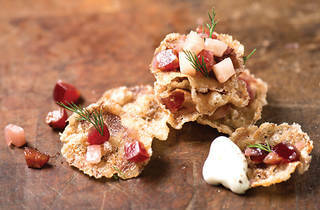 We like the hog nuggets ($180 for three), an 18-hour slow-cooked pulled pork fried nugget served with beetroot ketchup, which has a saucy texture that cuts through the greasy shell with its natural acids. We also love the chicken lollipops ($168 for three), half-boned wings covered in a cornflake crumbed crust that adds interest to its texture with a mealy bite. Lazy Hog 29 Bridges St, Central, 2858 1321. Dinner for two: $1,000.